MLB umpires may soon wear microphones to explain Replay Review decisions and other complex rulings, according to AP sources familiar with the situation and speaking on condition of anonymity. Crew Chiefs could soon speak to the crowd. The move would bring baseball officials into the mic'd up fold most commonly associated with referees in college football, the NFL, and NHL, who all presently utilize the stadium or arena PA systems when announcing penalties and touchdown/goal review decisions. Under one proposed plan, the first game to feature a microphone-equipped Crew Chief may be the July 11, 2017 All-Star Game in Miami, before the experiment becomes a reality in the postseason. This and any other potential plans to outfit umpires with microphones would have to gain approval from the World Umpires Association—the umpiring union—and be agreeable to the League. The AP report declined to specify a timetable for when (or if) such agreement may be reached nor whether Crew Chiefs would utilize the public address system in order to explain complex rulings that may not be subject to Replay Review. If implemented, the MLB microphone plan is expected to clear up the confusion that exists between "Call Stands" and "Call Confirmed" rulings, which both presently result in the Crew Chief displaying the same mechanic (e.g., "out" or "safe"), but for different reasons. Baseball umpires in Japan already use microphones to explain complicated or confusing plays. 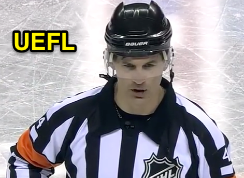 NHL referees are mic'd during hockey games. In football and hockey, the referee mic system has provided additional entertainment on occasion. For instance, NHL referee Mike Leggo once scolded a player over the PA: "You can't do that," and Wes McCauley has had fun toning his dramatic muscle in announcing a goal (and fighting penalties)...though Brad Watson once confused Anaheim with Atlanta [https://www.youtube.com/watch?v=gA_haRikjB4]. In the NFL, referee Ed Hochuli has become somewhat of an officiating celebrity through his physique and extensive use of the PA to explain complex football rules, though microphones have also produced their fair share of football referee bloopers. NFL referees use PA mics to explain calls. "Give the Crew Chief a microphone" was bullet point number one in the pre-season "Tmac's Teachable Moments - Let's Fix Replay" discussion of Replay Review. Thus far, we have already seen two of tmac's proposals see the light of day, as managers now have a 30-second time limit in which to file a Manager's Challenge, and Replay Officials have a guideline of two minutes for rendering a decision.